Here’s an ity bity laser engraver that will be on Amazon’s Hottest Deals at 5:20AM Pacific time for Prime members. Currently $119.99, hottest deal price to be revealed at 5:20. Cute. Would be great for doing food engraving, I suspect. I’m going to speculate… just under $100 or 20% off. There’s lots of these little CD-caddy laser cutters. They scare me, frankly. They want 1A power, but PC USB ports are only designed for 500mA (with maybe short spikes up to 600mA). So you’re having to use either a second USB port or an external power brick. USB 3 is designed for 900mA, though, which is less of a stretch, and if you have any type c ports they support five amps! This makes me feel so old. Just about a month ago I started disassembling my homebuilt one of these for parts. And yeah, they really ought to have a separate power supply. 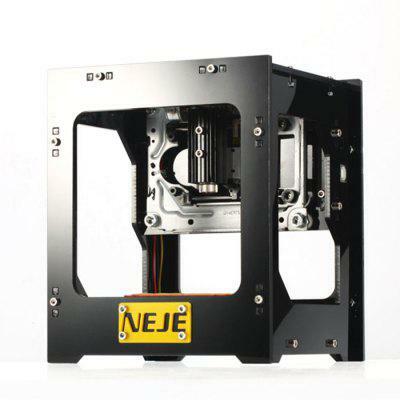 Just US$75.35 + free shipping, buy NEJE DK-8 Pro-5 500mW Laser Engraver Printer online shopping at GearBest.com. All based on essentially the same design. If you have access to surplus optical drives then it’s just a matter of which diode laser you use. (And if you’re selling in bulk you can even put in the design effort and use the IR lasers the old drives come with). I still want to build a laser pen to do etching/burning by hand, but the interlock system would be much bigger than the pen. Just a word of caution for those of us in the US… Gearbest is not a US based company, and their shipments take forever to arrive. The prices are awesome, I ordered a light for my mountain bike from them for 1/4 of what I would pay for a similar light in any US store, but I had to wait like two months to get it. I found a K40 nearby on Craigslist instead when this one went back. I’m curious to see how the 1000mW machines work. I’m curious to see how the 1000mW machines work. In my limited experience, at 1000mW you can engrave pretty well (if what you mean by “engrave” is “make charred or bleached marks”). You can also cut through thin plastics and very thin wood if you’re willing to move very slowly and have so-so edge quality. But (imo) once you’ve proved you can do it, the wonder palls. Once you get up into the 2-4 watt range things become more interesting (and also more dangerous).